The global economy experienced a sluggish year in 2016, with several unexpected events, such as the Brexit vote and Donald Trump’s surprise election victory, stunting growth around the world. However, despite the uncertainty, Vietnam’s economy remained stable, with GDP growth exceeding the averages posted by neighbouring south-east Asian countries and emerging Asian economies. The country’s stock markets also generated significant uptrends throughout the year, with the VN and HNX indexes having grown a combined 15 percent year-on-year and the total market capitalisation of Vietnam’s most prominent exchanges amounting to 37 percent of GDP. Vietnam’s success can be largely attributed to the state’s commitment to creating an attractive business environment for both domestic and international companies. Building on the country’s solid foundations, the government has introduced a number of regulatory changes to help increase both foreign direct investment (FDI) and foreign portfolio investment. This pro-business attitude has also stimulated growth in the private sector, driving local business and improving competition. By leveraging the country’s political stability, sustainable economy and high quality investment opportunities, Vietnam has become an attractive proposition to investors around the world. Here at BIDV Securities Company (BSC), we fully expect Vietnam’s steady growth to continue in the years to come. Under the management of the State Bank of Vietnam (SBV), the Vietnamese financial system has continued to thrive. The government’s commitment to creating a favourable business environment has seen foreign investment grow significantly in the past decade, with FDI businesses now accounting for 71.6 percent of the country’s export turnover. The introduction of new regulatory frameworks has been key to attracting these high levels of foreign investment, and has helped control inflation, motivate economic growth and stabilise the interest rate domestically. By adopting active and flexible fiscal policies, the government has turned Vietnam into a business hub. Some changes involve a daily adjusted rate, providing tax breaks to specific sectors, reducing corporate tax and providing a number of support packages to both foreign and local businesses. These packages have primarily focused on growth and attracting investment, aiding the development of social housing and hi-tech agriculture while also providing support to the country’s rising number of start-ups. These pro-business changes have been spurred by the long-term stabilisation of interest rates, which has provided the means for increased capital expenditure. This capital has been largely devoted to the development of the private sector, which has become an important driver of the economy in recent years, contributing 40 percent of GDP. To this end, the Vietnamese Government is carrying out a comprehensive renovation of the regulatory system. By simplifying procedures, enhancing national competitiveness and improving transparency, the government has created an environment geared towards international business. In fact, the changes implemented by the government witnessed Vietnam rise nine places on the World Bank’s Business Environment 2017 report. The report cited the country’s significant improvement in areas such as the protection of small investors, taxation and international trade as the reasons for the rise. With a view to encouraging further growth, the government has sought to clarify its position within the market. Since the start of 2016, SBV has given daily updates on both the country’s central exchange rate and the foreign exchange market. These announcements have helped standardise market valuations and dull any potential shocks to the Vietnamese economy. The government has also publicly clarified which industries it intends to maintain a controlling stake in, and which enterprises it will pull funding from in the near future. This clarification has reinforced the country’s stock market, giving investors a clearer understanding of the market and strengthening the position of state-owned businesses. Furthermore, the announcement is expected to encourage a flurry of IPOs in the coming year, with many industry-leading state-owned enterprises planning to participate. Should these IPOs come to pass, the Vietnamese stock market will be provided with quality investment choices, and foreign investors will be able to diversify their portfolios within the market, in turn bringing further capital into the country. As a result, Vietnam’s stock market is expected to record an uptick in both index value and liquidity in 2017. In addition, the government has sped up the reorganisation of Vietnam’s banking sector, restructuring the debts held by joint stock commercial banks and consolidating or merging unprofitable banks in order to increase capital capacity. This has helped to standardise state-owned enterprises and has allowed foreign investors to buy shares in both public and private companies. With a stable government and a growing level of economic integration, Vietnam is now considered to be one of the world’s most attractive markets for foreign investment. The state’s commitment to establishing a business-friendly environment has seen FDI rise steadily since 2009, reaching a staggering $15.8bn in 2016, according to the Ministry of Planning and Investment (MPI) (see Fig 1). Manufacturing has remained the most popular industry for foreign investment. In the coming months, the government will continue to invest in supply industries, advanced technologies and environmentally friendly practices in order to attract foreign investment and strengthen the link with domestic enterprises further. Vietnam’s sizeable marketplace and relatively large population – 60 percent of which is aged under 35 – have attracted growing interest from the likes of Hong Kong, Japan, South Korea and the US, all of which have committed to economic integration in general and free trade agreements in particular. In fact, Vietnam now holds 16 independent free trade agreements with strategic partners from around the world. As a result, Vietnam has witnessed an increase in the number of mergers and acquisitions (M&As) in the last few years. The United Nations Conference on Trade and Development suggested the number of M&As rose by as much as 61 percent in 2015, with 531 deals with a total value of $5bn executed during this time. This growth continued into 2016, with more than 600 transactions taking place, and is expected to rise again in 2017. The size of these deals has also increased, with the total value of M&As in 2016 reaching $6bn. 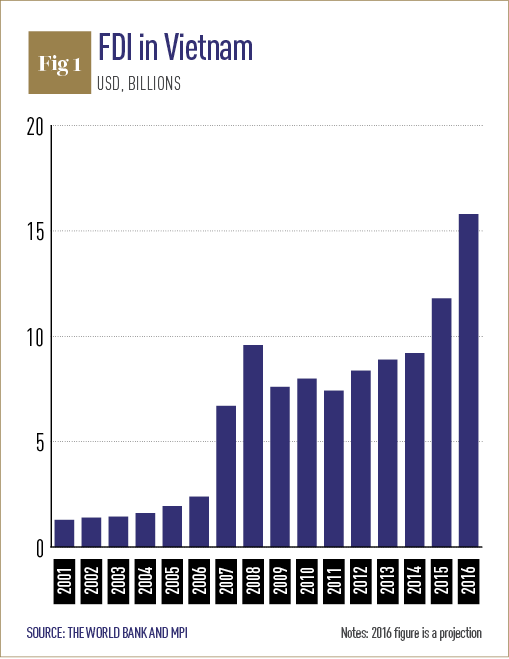 More impressively, foreign investment accounted for 46 percent of all M&As during this period. With the economy opening up, many high profile transactions have been carried out between Vietnamese and foreign industry leaders. For example, Thai retailer TCC Holding successfully acquired Metro Cash and Carry Vietnam, while Japanese carrier ANA Holdings purchased Vietnam Airlines. These deals helped Vietnam rise to 15th place on the global M&A rankings, a stark contrast to the slowdown experienced across the Asia-Pacific region. Indirect investment in Vietnam has also reached a record high. The improved transparency demanded of Vietnamese businesses, along with a reduction in foreign ownership limits and the introduction of new investment products, has seen foreign investors’ holdings in the stock market skyrocket. By February 2017, investment in the Vietnamese stock market had reached $20bn. Nonetheless, despite reaching record levels, foreign investors appear to have remained relatively cautious, favouring companies with traditionally high dividend yields, such as those in the food and beverage, real estate, or consumer goods markets. Investors also predominantly looked towards the market leaders and those companies set to lose state funding. With a significant increase in foreign investment, BSC’s role in the Vietnamese financial market has continued to grow. Presently, we manage more than 2,000 foreign trading accounts, with a combined trading total in excess of VND 1.3trn ($57.3m). 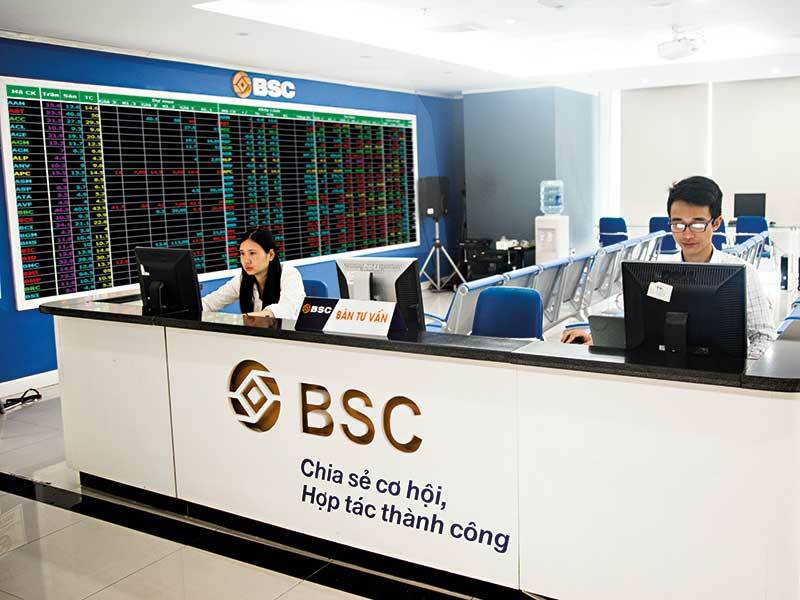 With business relations extending to around 50 foreign funds, BSC is one of the most active market participants in Vietnam, and has facilitated the country’s growth over the past decade. As a local financial advisor, BSC guides clients through M&A transactions, whether buying or selling. In just one year, we closed two gigantic deals, helping a Danish private equity fund divest its shares in a Vietnamese window manufacturer to a Japanese investor, and assisting a multi-national Korean-based firm purchase a Vietnamese food processing company. We currently have a further three deals active, and have also continued expanding relationships with funds around the world. These relationships will be essential to BSC’s growth in the future, as we look to build on the successes of the past few years and extend our operations internationally. The strength of the economy has allowed Vietnam to take to the world stage, and as investment continues to facilitate growth and provide a platform for expansion, BSC will seek to play the leading role in Vietnam’s international development.